as well as magico-religious and curing rituals. Ipomea violacea seeds give a quiet, dreamy and trippy experience, a clear mind and an heightened sensitivity to light and sounds. The seeds of some varieties contain LSA (D-lysergic acid amide) and can cause visual and perceptual effects similar to LSD. 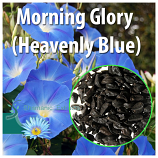 There are many sorts of morning glory seeds. At the moment we sell Heavenly Blue, Flying Saucers. 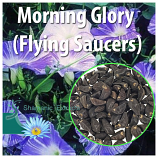 The Heavenly Blue, and Flying Saucers seeds are most popular. They are used for tripping because they contain the highest amount of LSA of all kinds. The description of effects and user information below concern only this variety. Like LSD, LSA is a psychedelic or hallucinogen which can have strong mental effects. It will give you a quiet, dreamy and trippy experience. The primary effects are as follows: dreamy-state, happiness, ability to focus and become intensely interested in anything you like, inability to concentrate on complex tasks such as programming, or driving, extreme mellowness. Because use is oral, onset is affected by the last food that was ingested. On a relatively empty stomach (try not to eat 4-6 hours before you eat the seeds), onset of effects is about an hour after ingestion, although it can be many hours before peak effects are reached. Primary effects last 6-10 hours when seeds are taken orally. * Chew for as long as possible and swallow. * Grind and soak in water for 1/2 hour, strain and drink. * Sprout by soaking in water for 3-4 days (change water often), after which the white mushy part is removed from the shell and eaten. This is probably the best method for avoiding side effects, although it makes the effects a little bit less intensive.